Aloha Kaena Wine Friends & Followers! Those of you who follow the Kaena label closely know that Mikael Sigouin's passion for the Grenache varietal runs deep and true. 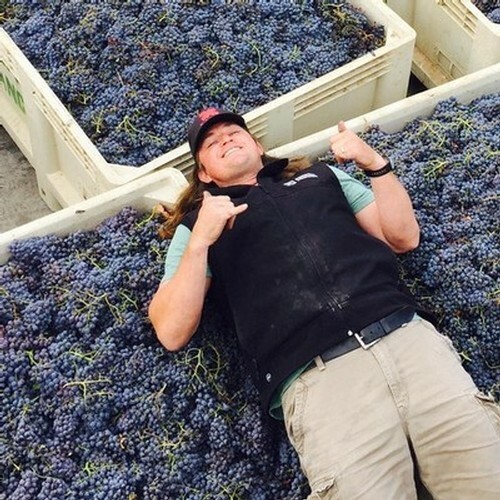 For the past 18 years, Mikeal's love for Grenache has inspired not only a focus for his label but the want to educate others on this special varietal that flourishes in the Santa Ynez Valley. Grenache is one of the most widely planted wine grape varieties in the world, with vast acreages encompassing the southern Mediterranean wine region. It is generally believed to have origionated from the northern Spanish province of Aragon. However, the first documented planting of Grenache was in the Longuedoc region of France in the early eighteenth century. The varietal did not reach the southern Rhone Valley until the nineteenth centry. The vine has potentionally high vigor in medium- to fine- texured soils (sandy loam to clay loam) and low vigor on sandy soils. This is a varietal that usually ripes late, so it needs hot and dry conditions to thrive and reach its full potential. The typically medium to large clusters are also accompanied by leaves of a smooth waxy nature (like wax paper), which helps to reflect the direct sunlight. Kaena Wine Company's Grenache Noir block via Tierra Alta Vineyard, Ballard Canyon. ​​Kaena has yet to bring in their Grenache 2017 crop so please stay tuned as we will keep you updated on all Grenache / Harvest 2017 happenings! Speaking of Grenache ...you didn't think that your Aloha Crew forgot about International Grenache Day did you? 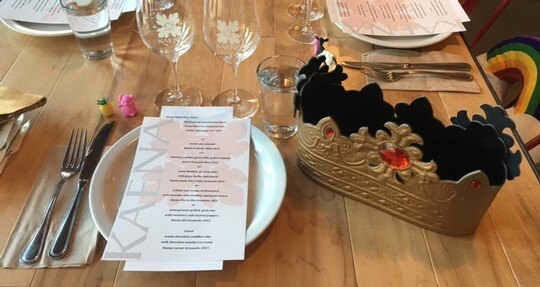 Last Friday (9/15) Kaena Wine Company and friends celebrated International Grenache Day with an event fit for a king....the Grenache King that is. We were stoked to have the support of Gabe Saglie, of Travelzoo & Santa Barbara News Press, to help spead the word of our IGD plans leading up to the event. During the formal interview, Mikael was given the opportunity to explain where the term 'Grenache King' originated. “I didn’t name myself, it was my peers,” he admits. “But I’m pretty sure I’ve worked with more grenache than most people in the state,” said Mikael Sigouin via his interview with Gabe Saglie. Please CLICK HERE to read full article by Gabe Saglie/ published in Santa Barbara News Press 9/14/17! 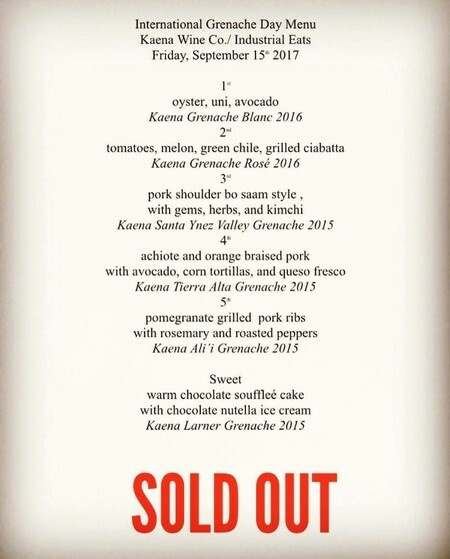 ​This year Kaena Wine Company celebrated International Grenache Day by teaming up with the talented Jeff Olsen of Industrial Eats to create a six course.... farm to table fresh... Grenache paired... dinner extravaganza of a lifetime. 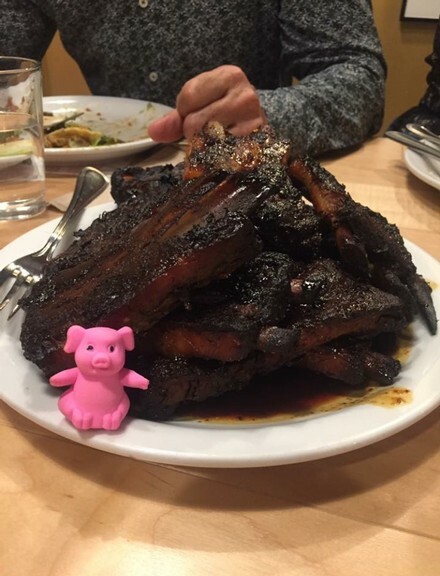 Did we mention that our winemaker believes pork is the true soulmate pairing to Grenache? 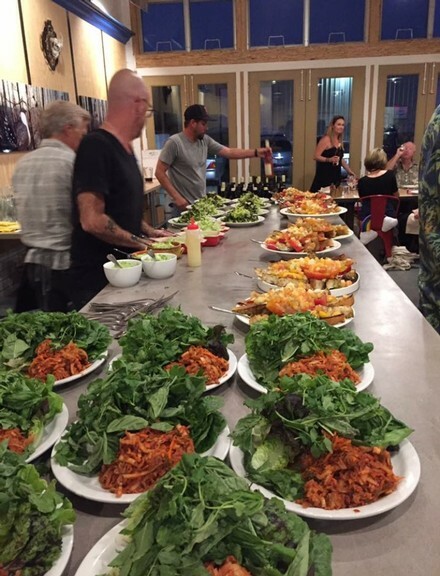 The Aloha Crew is thrilled to announce that our (SOLD OUT) 2017 International Grenache Day Dinner was an evening of true magic and delicious inspiration! 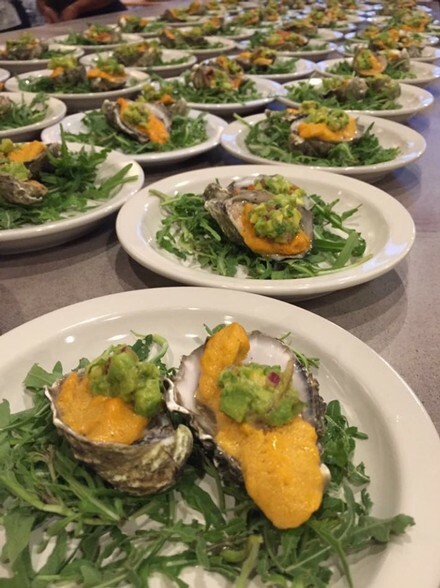 We were blessed to have celebrated our favorite varietal with an enthusiastic group of fellow winemakers, farmers, wine growers, and incredible wine club members via the 'Grand Room' of Industrial Eats ( Buellton, CA )!